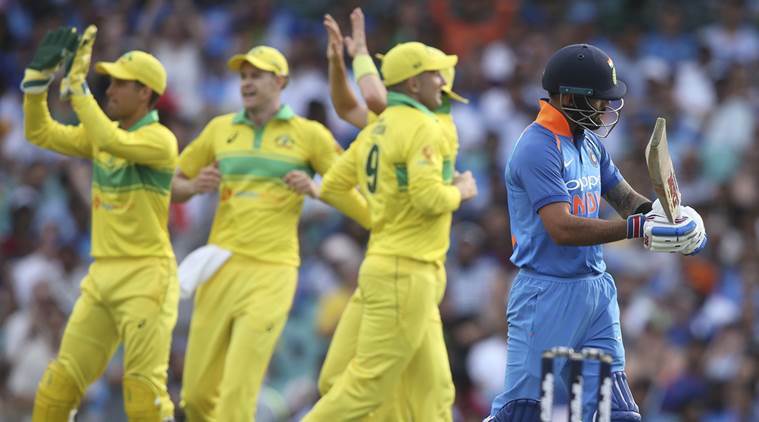 India vs Australia 1st ODI Highlights: The series has started with an upset as Australia defend a total of 288 despite Rohit Sharma scoring 133. India vs Australia 1st ODI Highlights: Rohit Sharma’s 133 went in vain as India failed to chase a target of 289. Australia go to Adelaide with a 1-0 lead in the series. Rohit and MS Dhoni’s rebuilding effort ate up too many overs but the real damage was done in the early part of the Indian innings when Jhye Richardson and Jason Behrendorff blew away the Indian top order. Rohit scored 133 off 129 balls but never really got a reliable partner at the other end after Dhoni’s dismissal. While the pair put up 137 runs for the fourth wicket, none of the other partnership crossed 30. "Credit to them. They gave us a run through the middle. But like Finchy said when you get teams three down that's what you aim for. Getting (Kohli) is one that I'm going to treasure for a long time. But more happy to get the win." "Very pleased. We knew that they'd try and take it deep and luckily we were able to take wickets and stem the flow. I thought we were around par. I thought with the earlier start dew wouldn't come in. We felt the wicket would slow up a bit so I thought it was par. I thought the partnership between Khawaja and Marsh set us up and Pete Handscomb payed a gem. Anytime you get a team three down early and three big guns it's very important. I thought Jason handled his nerves brilliantly. And then the youngster Jhye is full of confidence and he's got a bright future ahead of him. There's always room to improve." "We're not very pleased with the way we played. I think we were fine with the ball. That wicket was 300 plus par. I think we did well with the ball. We thought 288 was quite gettable. Losing three wickets upfront is never good. I thought Rohit was outstanding and MS supported him but I thought we could have done better with the tempo of the game and we fell short. They took the game deep to give us a chance. MS got out at that stage. That put pressure on Rohit. One more good partnership and we would have got close. But losing three wickets up front was the problem and Australia were professional enough not to let us back in. I think we have to take it as a day when Australia played better than us. We're not too stressed about results. I think days like these make you aware of things you have to work on as a team." Shami sends the last ball of the Indian innings about 1000 feet above sea level, Glenn Maxwell keeps his eye trained on it and finishes the catch. Australia have managed to defend 289 on a batting-friendly track against India despite Rohit Sharma scoring 133. This has been a brilliant team performance from Australia. The batsmen were not too bad but the bowlers have taken the cake here. Jhye Richardson ends the match with four wickets to his name. This time Khawaja holds on. Kuldeep sends it straight to him at deep backward square. India need 42 to win off the last over now. Might just be out of reach for them. He tries to lift Stoinis over long-on but mistimes it, the ball goes high up in the air, Khawaja goes reverse cupped and he drops it! He had dropped Bhuvneshwar earlier too but that was much more difficult than this one. Bhuvneshwar is getting some ODI runs for himself here. That has to be the end of the Indian run chase. Rohit tries to heave a slow ball over midwicket, gets a top edge, and deep midwicket Glenn Maxwell takes the catch. He walks off to a standing ovation from the SCG crowd having made 133 off 129 balls, India 221/7. He is knackered, takes a single off Stoinis, gets back on strike after the next ball and then lofts him over long on for four. Jadeja holes out backward point. Rohit is running out of partners here. Jadeja tries to join the party, ends up holing out in backward point. Stoinis bowls it right in the slot, Rohit likes it and flicks it away for a six, thank you very much. A four off the next ball and moves to 127. Rohit Sharma brings it up with a cloud-kisser off Nathan Lyon again. Rohit Sharma has slammed quite a few sixes off Lyon in this innings. 22nd ODI century, 7th against Australia, fifth in Australia. He does not celebrate it too much though as there is a job at hand. India need 109 to win off 60 balls. That's Jhye Richardson's third wicket of the day. Short delivery that Karthik looks to pull, the ball takes his inside edge and crashes on to the base of middle. Replays showed he had almost overstepped. He is turning it on, the Indian vice-captain. Smashes 16 runs through fours off Peter Siddles's over. India are now 176/4, need 113 to win off 66 balls. Dinesh Karthik is in the middle with Rohit who has now reached 80. But replays show that MS Dhoni probably should have still been out there. The ball was pitching outside leg. Behrendorff gets the breakthrough, 137-run stand ends. Dhoni looks to flick it on the leg side but misses it, he takes a look for a second or two before walking off. This exactly what Australia were looking for. He brings that up with a four off Lyon. It is his 67th 50 and the game is now slipping faster and faster away. Rohit Sharma steps down the track to Lyon and lofts him into the clouds. He moves into the 70's. India may have a high required run rate but at the moment, it is Australia looking absolutely clueless. Into the second half of the Indian innings now and the two batsmen continue in the same stead. Dhoni had to put in a full-stretch dive to take a single as Marsh missed the stumps with his throw. This is an incredible knock from him but he has done this so often that there no longer is any surprise in it. Australia looking for a wicket. India's required rate has now climbed over seven but such is the prowess of these two batsmen that one gets the sense that the game is slipping out of Australia's hands. The partnership between Dhoni and Rohit has now crossed 80. Rohit and Dhoni are settled in and this will worry Australia. It has been a slow partnership but these are players who can switch gears like few others in the ODI game. Rohit Sharma spoils a good over from Nathan Lyon. Steps down the track and lifts the ball behind dep square and it touches the clouds before settling in the stands. India 53/3 off 17. First Rohit pulls Siddle behind square for a six and then Dhoni skips down the track to Lyon in the next over to smash him over long-on for a maximum. Australia need to get at least one of these two out now, or else this partnership can end the match. Dhoni has been in the middle for 35 balls and scored just 6. Rohit tries to go big on Siddle in the 14th over and misses it completely. It goes to the keeper. India are 26/3 in 14th over. There is bound to be some confusion as to how it is that Dhoni has crossed 10,000 runs now when he had already done so in July 2018. Dhoni has also played a match for Asia XI which was considered an ODI. His first 10,000 was his own career total whereas this one is the number of runs he has made for India exclusively. His first over in ODI cricket since 2010 and he replaces Jhye Richardson for it. His first ball was given a leg bye, although there was a big inside edge off Dhoni. Run rate of 2.13. Dhoni is not looking too good at the moment and Rohit Sharma is still settling in but India won't mind the pace of the innings at the moment. Both these players need to get their eye in properly for them to back in this match. Behrendorff oversteps a delivery and it is now a free hit. Rohit Sharma flicks it off his pads and it goes high over deep square. Shaun Marsh catches it and throws back inside in an attempt to save it but replays show he had touched the ropes. Rohit Sharma is now in the middle with MS Dhoni. Perhaps, in these turbulent times, it is the calmness of these players that India need. India's top order has been blown to bits within the first four overs! Rayudu has a long chat with Rohit before taking the review. Three reds and Rayudu goes. Full and fast, angling into Rayudu and no inside edge. Brilliant stuff this from the Australian pacers. OUT! KOHLI GONE FOR 3! Jhye Richardson gets the big one! Kohli flicks it to square leg who had to move a little to his right to get to it. Catching practice for him, two of India's mighty top three back in the hut! Behrendorff's gets a wicket in his very first over of ODI cricket. Dhawan is plumb this time. No inside edge and it hits him full on the pad right in front off. No need to review that, India lose an opener. Behrendorff bowls it full, swinging into Rohit Sharma's pad, Australia appeal and go for a review after umpire shakes his head! Utter madness. It pitched outside leg and there is no way it could have hit the stumps. Australia have thrown a review into the sewer. 18 runs off the final over. Australia have set India a target of 289 to chase. Marsh and Khawaja's 50's helped steady the ship for Australia but they never give a good pace to the run rate. Hanscomb and Stoinis did whatever they could to accelerate which is the reason why Australia managed to reach 288. If the hosts can't get the Indian top three out as quickly as possible, this chase would be a piece of cake for the visitors. Bhuvneshwar charging in, Stoinis on strike. Australia are 271/5, which would have been a good total if they were playing this match in the 1980s. Bhuvneshwar gets his second. Handscomb tries to go long but only finds Dhawan at sweeper cover. He catches the ball, turns around and does the thigh slap for the Indian crowd. Glenn Maxwell is in and Australia need a hitathon from him. Handscomb pulls and Bhuvi has conceded a six for the first time in the match. Australia need much, much more of this. It is the 48th over and they have crossed 250 only now. Over 45 deliveries had passed without a boundary when Stoinis lifted Kuldeep over the long-on boundary for the first maximum of the innings. Two balls later, Peter Handscomb brought up his 50 with another big hit. ...and the time has come! Flighted outside off, Marsh comes down the track to lift it over long-on, doesn't get it on the middle and Shami comes forward to take the catch. Marsh goes for 54, Australia simply cannot get a partnership going.